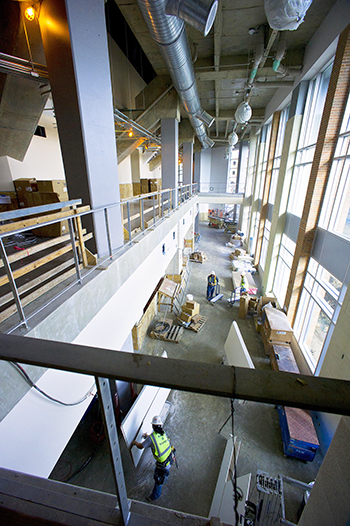 Returning students, faculty, staff, and visitors will see a number of substantial, physical campus changes from spring. Parking lots were expanded on the west and south side of campus, with a new handicapped-accessible lot on West Street at Planetarium Place. On the southern edge of campus, the Science and Engineering Innovation and Research building will begin construction later this year. A new 500-bed residence hall, a dining hall, and a 1,500-car parking garage are planned for the west side of campus. LEARN MORE. The Central Library has moved the Friday and Saturday closing times from 8 p.m. to 2 a.m. At the Science and Engineering Library, the Sunday-Thursday closing time changed from 11 p.m. to 2 a.m. For other hours, go to library.uta.edu/hours. Telepresence robots are back and available for checkout by any faculty, staff, or student at the Central Library. Email the Robot Ambassadors or visit the website. Tail Waggin’ Wednesday returns with therapy dogs available noon-2 p.m. on the first Wednesday of each month September-November on the second floor of the Central Library. The Career Development Center has several ways to connect students with jobs, both on campus and off. On-campus interviews and job information tables benefit students by having companies come to campus. The College of Business BIZ-Network information sessions work the same way. The fall All-Majors Job Fair is 10 a.m.-3 p.m. Tuesday, Sept. 27, at the Maverick Activities Center. 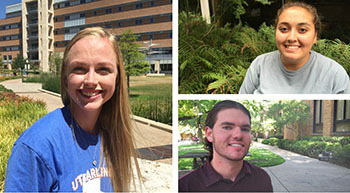 Snap Jobs provides students with information about on-campus jobs through UTA's Human Resources. Current openings include an executive internship with the Office of the President (#9240), resident assistants with Apartment and Residence Life (#9234), and several peer educator positions with TRIO-Student Support Services. LEARN MORE. A diverse student body and a tradition of academic excellence attracted top high school scholars to UTA. More than 20 valedictorians, salutatorians, and National Merit Scholars from across North Texas are members of the Class of 2020. Watch the video. Friday, Sept. 9—Deadline to apply for fall graduation. Monday, Sept. 12—Census date for fall semester. Friday, Oct. 7—Fall Candidates for Graduation: Privacy settings in MyMav will be used to determine inclusion of your name in the Commencement booklet and The Shorthorn graduation edition. The Family Educational Rights and Privacy Act (FERPA) affords to students rights with respect to their education records. These rights include: the right to inspect and review your education record; the right to request amendments to your education record which you believe are inaccurate or misleading; the right to provide written consent before the University discloses personally identifiable information from your record, except to the extent FERPA authorizes disclosure without consent; and the right to file a complaint with the U.S. Department of Education. Read more about your privacy rights and FERPA policies and procedures. UTA's new Park and Ride—only $90—allows students to park at Maverick Stadium (Lot 25) or the intramural fields complex (Lot 26) and ride shuttle buses to class. The buses takes students to the Business Building in about 12-15 minutes and the Smart Hospital in 20 minutes. Read about all parking options. LEARN MORE. The Office of Information Technology reminds students not to open email attachments from suspicious or unexpected emails and not to forward them to your personal computer. A malware attack last week was aimed at faculty and staff email accounts. 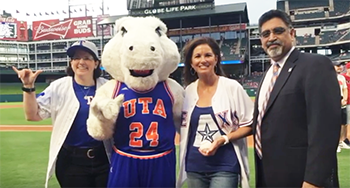 Maverick faculty, staff, students, and alumni gathered to cheer on the Texas Rangers during UTA Night at the Rangers on Aug. 26. Distinguished Alum Tamara Hext Hilliard fired off an impressive ceremonial first pitch. From the first at-bat to the final out, UTA fans bonded over baseball. Watch the video.